Breaking news developed for ARM today, July 25th, 2018, following a decision by the Third district Florida appeals court, to reverse a previous ruling on an illegal animal slaughter farm investigation that ARM investigators initiated in 2013. 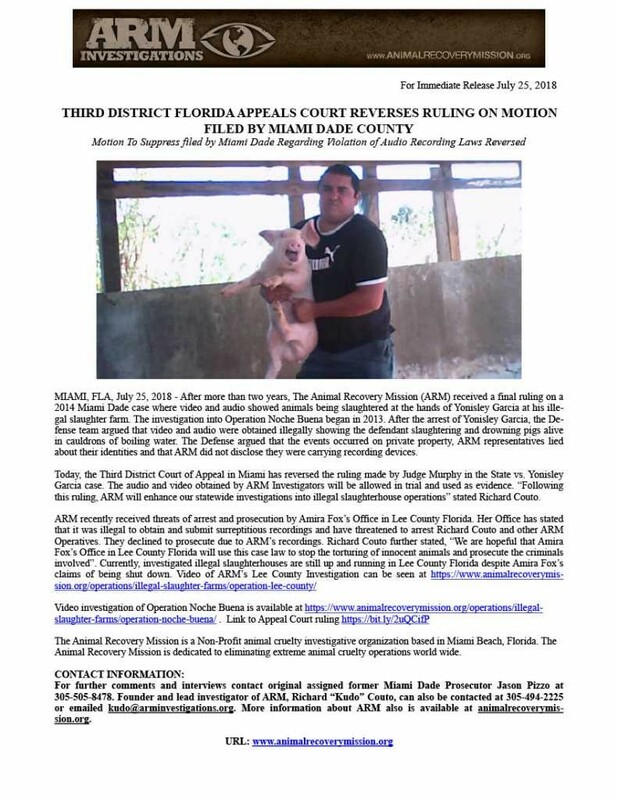 After more than two years after its evidence was presented, The Animal Recovery Mission (ARM) received a final ruling on a Miami-Dade case where video and audio evidence showed animals being slaughtered at the hands of Yonisley Garcia at his illegal slaughter farm in Florida, titled, ‘Operation Noche Buena’. At the release of the investigation upon Operation Noche Buena, Yonisley Garcia was arrested. 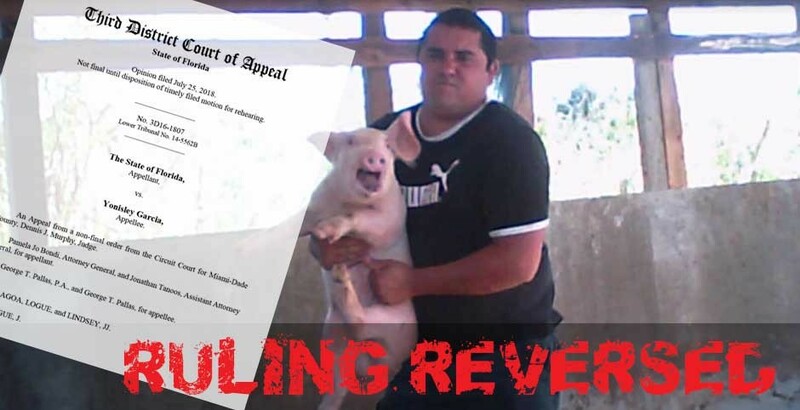 ARM’s footage captured Garcia conducting a public business of selling and slaughtering animals for humane consumption. It also demonstrated Garcia, and workers of the business, executing extreme degrees of animal cruelty and torture including; dragging pigs with Gaffhooks, bludgeoning animals to death with hammers, slaughtering animals inhumanely and drowning pigs alive in cauldrons of bowling water. However, during his prosecution, Garcia’s defense team argued that the video and audio obtained by ARM investigators was conducted illegally. The defense also presented to the court that the events which occurred on private property, were captured by ARM representatives who had not disclosed that they were carrying recording devices. 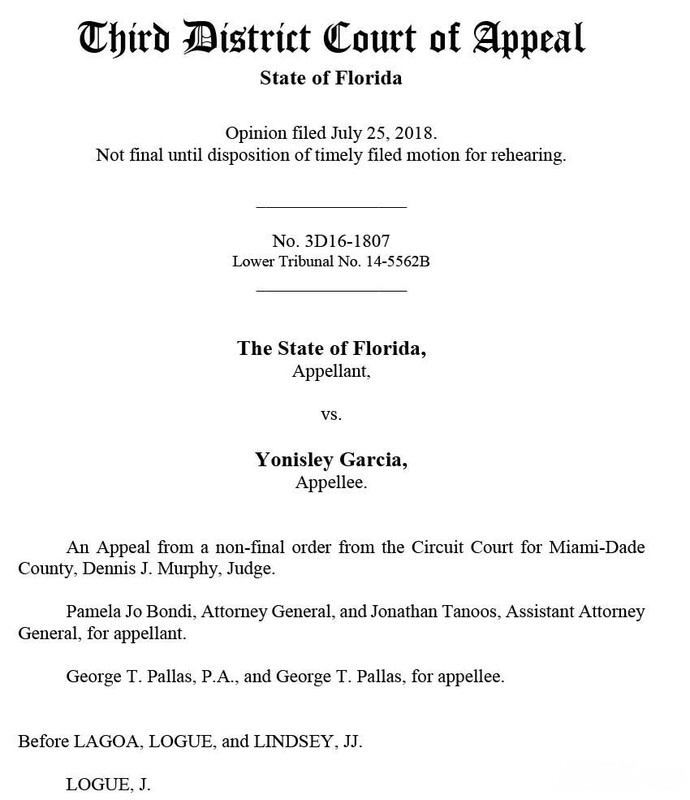 Today the Third District Court of Appeal in Tallahassee reversed the ruling made by Judge Murphy in the State vs. Yonisley Garcia case. The audio and video obtained by ARM Investigators will now be allowed in trial and used as evidence. Click here to view the Appeal Court ruling. This case will be remanded to the trial court for rehearing, where the judge will view the evidence (i.e video of a crowd around slaughtering helpless animals) and rule that there is no expectation of privacy, just as Palm Beach ruled, in ARM’s favor. This development has not only created new state wide law, but it has set the tone in addressing and re-opening other challenging cases which ARM has endured after presenting its investigative findings. This includes the four illegal animal slaughter farms investigations in Ft Myers, which ARM recently received threats of arrest and prosecution by the State Attorney’s Office in Lee County, Florida. Lee County SAO stated that it was illegal to obtain and submit surreptitious recordings and has even threatened to arrest ARM’s Founder, Richard Couto, and other ARM Operatives. Official agencies declined to prosecute due to ARM’s recordings. Future developments will be updated here.